We have combined a protein fudge centre with a thick layer of caramel and nuts for the best tasting protein bar. Low on sugars and carbs this is the ultimate protein packed snack on-the-go. 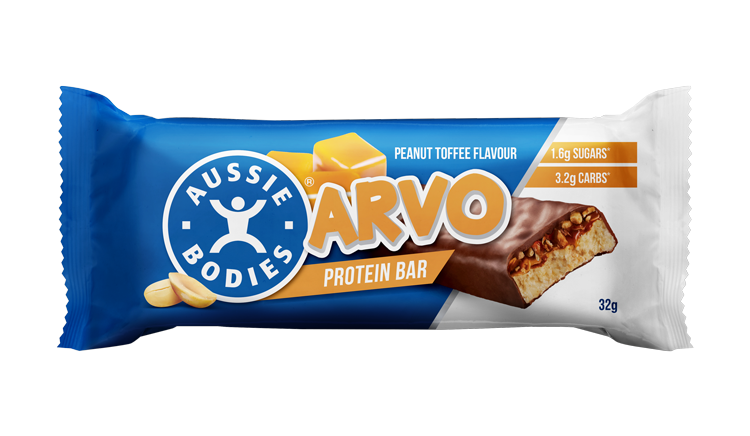 Aussie Bodies® Protein Blend (25%) [Calcium Caseinate, Whey Protein Isolate, Soy Protein Isolate, Soy Protein Crisps (Soy Protein Isolate, Tapioca Starch, Salt), Emulsifiers (Soy Lecithin, 471)], Protein Milk Chocolate (25%) [Maltitol, Cocoa Butter, Milk Solids, Cocoa Mass, Soy Protein Isolate, Emulsifier (Soy Lecithin), Natural Flavour], Polydextrose, Sorbitol, Peanuts (8%), Caramel (6%) [Glucose, Sweetened Condense Milk (Milk, Sugar, Lactose), Vegetable Fat, Unsalted Butter, Salt, Emulsifier (471)], Glycerol, Canola Oil, Natural Flavours, Maltodextrin (Corn Starch), Salt, Emulsifier (Soy Lecithin).